The Meijer Baseball Academy is a three-day camp with South Bend Cubs Players and Coaches, open to all kids ages 6 to 12. SOUTH BEND, IN - With the 2019 Midwest League season underway, the South Bend Cubs players and coaches are preparing for the 2019 Meijer Baseball Academy at Four Winds Field this July. The organization will welcome young baseball players of all skill levels to participate in the Academy for two three-day sessions that run from July 10 through July 12, and again from July 24 until July 26. The two academy training sessions are to help keep the camp sizes more concise and to allow more one-on-one interaction with the South Bend players and coaches. Registration is open to children from 6 to 12 years of age. Instruction from players and coaches will be based on the age and skill level of each participant. Throughout the three-day experience, participants will learn about hitting, pitching, fielding (infield and outfield), catching, and base running. The registration fee for one, three-day session is $125.00 per child. 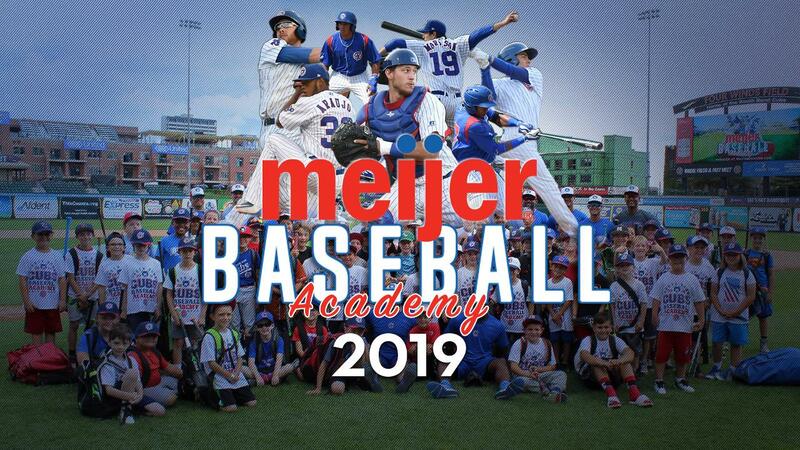 All attendees will receive a Meijer Baseball Academy t-shirt, a South Bend Cubs hat, lunch after each day of camp, and four (4) tickets to a South Bend Cubs game where all academy campers will participate in a pre-game recognition on the field. Check-in for the first day of each session will begin at 8:30 a.m. ET. Camps will run from 9:00 a.m. to 11:45 a.m., with lunch at 11:50 a.m. Do not delay in registering, there is a limit of only 85 kids per session with the registration deadline set for June 10. To sign up, download the application and wavier form available here and email it to Marketing@SouthBendCubs.com. Payments can be mailed or dropped off at the South Bend Cubs main office at Four Winds Field. Registration is not complete until payment has been received.